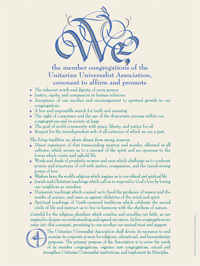 Catch everyone's attention with this handsome statement of UU Principles and Purposes. Printed in green, purple and silver on rich parchment. 18" x 24". Suitable for framing. Packaged in a cardboard tube. Awesome poster, though needs an update, Rev. Jami Yandle was instrumental in the language change in the second source "women and men", change to "prophetic people", in 2018.